Music in a movie has so many sectionalized areas such as composing, arranging, conducting, re-recording etc. which are all attended to by different dedicated professionals in Hollywood. Whereas, largely, it is a one-man show, in the context of our movies where it is the responsibility of one individual, called “Music Director”, who is usually a brand name by himself, though he might have umpteen musicians specialized in some aspect or other, ably supporting him informally! Often the Music Directors have strong lieutenants who are well versed in trained classical music to assist them, such as the late Pugazhenthi (of late K.V.Mahadevan). We have, in the present days, a huge flock of Music Directors with their own creative talents. In stark contrast to this there were relatively few Music Directors in the past. However, those times, most of them were very strong in classical base, particularly in Carnatic Music. People like, Papanasam Sivan, C.R.Subburaman, G.Ramanathan, T.R.Pappa, S.M.Subbiah Naidu, Sudarsanam, M.D.Parthasarathi, Emani Sankara Sastri, Rajeswara Rao, Master Venu, S.V.Venkatraman and many more stood tall amongst the film music makers. Most of them have spent long internships with senior music directors of their times, worked alongside with them under their supervision and had learnt the ropes. They gave us outstanding music, which have withstood the efflux of time! In this context of comparison, the current music scenario seems a large departure. There have been Tamil films with countless number of songs per movie. But you also had the AVM produced, S.Balachandar directed, thriller movie “Andha NaaL” devoid of any songs whatsoever, but with only background score. Even in those days, with abundantly talented Music Directors around, there were films, which openly plagiarized western tunes or Hindi film music. These could have been plainly due to compulsion from the Producers or Directors. Or even introducing a new genre to cine goers as a marketing tool. After all, mimicking is a form of compliment to the original! For instance, the AVM film ‘Oar Iravu’ (1951) had a hit song rendered by MLV, “Ayya Sami” under the baton of Music Director Sudarsanam. This song was based on the Hindi song “Gore Gore” from the film ‘Samadhi’, which was in turn based on the Latin American song “Chico Chico”, from the film “Cuban Pete”! ‘Kalyana Samayal Sadam’song from “Maya Bazaar” was inspired by the laugh tracks of the song “Laughing Samba”. I have read somewhere that some moviemakers in that era handed down a bunch of Western/Hindi film records to the prospective Music Director and advised them to adopt or at least adapt the tunes. If a Hindi film was dubbed in Tamil, then there was the need to keep the orchestration & tune of original Hindi song, to be sung in Tamil by a local play back artiste. There were many Hindi films dubbed in Tamil where senior Tamil playback artistes were used to sing. For instance, Vikki (G.Krishnaveni), wife of A.M.Raja, who had a long innings lasting over four decades & rendering thousands of songs in Telugu, Tamil, Telugu, Kannada, Malayalam, Hindi, and Sinhalese too, had sung in Raj Kapoor’s dubbed versions of “Aah” in Telugu and Tamil. “Raja ke aayegi bharaat” (Shankar-Jaikishen) became “Kalyana oorvalam varum”. Other than such dubbed versions, we have umpteen carbon copies of Hindi tunes. Modern Theatres produced ‘Digambara Samiyar’ (1950) (Music: S.M.Subbiah Naidu – G.Ramanathan) had two popular songs based entirely on Hindi tunes. The run away hit song, ‘Oosi pattase vedikkaiyaka’ was lifted from the Hindi song “ Oh…dilwale” and “parudappa parudappa’ was a straight lift from Hindi ‘Laralappa laralappa’ from “ek thi ladki”. In ‘Avan Amaran’ (1958), Music Director T.M.Ibrahim set tune to the song sung by Sirgazhi & A.P.Komala, “Kalana minjathayya”, which was a carbon copy of from a popular Hindi tune “Ramayya Vastavayya” from Raj Kapoor’s Shri.420. In fact one more song “Vaan mathi nee arivay” in the same film was also carbon copy of “Jaye to Jaye kahaan” rendered by Talat mehmood for Devanand in film Taxi Driver. Another Tamil number sung by Jikki in the music of G.Ramanathan from ‘Komathiyin kadhalan’ (1955), produced by T.R.Ramachandran,“anaganai nikartha azhagan”, which was a straight lift of the very popular Hindi song of Music Director C.Ramchandra’s composition “dekh tere sansar kitna badal gaya Insaan” from the movie “Nastik” (1954). G.Ramanathan was otherwise a very respected Music Director of repute, for his very popularly melodic carnatic based tunes. Our highlighting such outright adoption of the then existing Hindi tunes is not to put down the concerned Music Director. This is simply to highlight a timeframe, in the anthology of Tamil film music, when such plagiarism was sometime routinely in vogue. If the Producer & Director insisted on copying an already popular tune those poor Music Directors never had a way out! “Konjum Purave” by MLV was a clone of ‘Thandi Hawaain’ by Lata Mangeshkar, set to music by the legend S.D.Burman in the film ‘Naujawan’ (1951). The very same tune was lifted in Tamil film “Thai Ullam” (1952) as “Konjuum Purave”. Nevertheless the Tamil version became a huge hit, owing to the lovely tune as well as the silky voice of MLV. I remember having heard this song, as a child, being played all over in Madras, in the fifties. The music score was duo V.Nagaiah & Ramachandra Rao. Coming to the song, the “Konjum Purave” opens with the First violinst to the slow humming of MLV to the backdrop of vibrafone, but quickly transforms into a quick-beated foot tapper with its Dholak percussion . The intermittent BGM brings back the first Violinist’s melancholic strains before MLV goes on to her fast pace. Whereas S.D.Burman’s BGM arrangement is uniquely different, with Hawain Guitar for interludes in place of the Tamil version’s Violin. The young Lataji’s voice is more delicate than that of MLV. M.S.Rajeswari rendered “Enni Enni Parkum Manam Inbam Kondaduthae”, composed by R. Sudarsanam. The identical tune was used in the song “Chup Chup Khade Ho Tho” sung by Lata under the baton of the duo Husnlal-Bhagatram, in the Hindi Film Badi Behen released in the same year. While Vazhkai was remade in Hindi only in 1951 as Bahaar, in which Vyjayanthimala made her debut Hindi films, it is not clear as to which version of the tune was the original. Another interesting info: The Jewish Music Research Centre, Israel has published a CD containing the rare Jewish songs in Malayalam language representing the Jewish tradition that was in Kochi from where a lot of Malayali Jews migrated to Israel. One of the Malayalam songs in such CD “Enni enni tirttu dinam” – a Zionist song celebrating the Israeli independence from British, has been set to the tune of “Enni enni parkkum manam”. Much later, Music Director Vedha was known in using popular Hindi tunes in his songs. His song “Oho ethanai azhagu irubathu vayathinile’ from Athey Kangal reminded you of ‘Pedal Pushers’ by Ventures. Occasionally you could see even MSV using tunes from overseas in his songs. “Anubavam pudumai’ in Kathalikka Neramillai was based on Italian melody “Besame Mucho”. Puthiya Paravai’s ‘Partha gnabagam illaiyo’ reminded the American tune ”Sway with me”. Even R.D.Burman’s ‘ Mil Gaya’ was a total lift from ABBA’s “Mama Mia”. Shankar-Ganesh’s ‘Megame Megame’ too was a replay of the tune from a Ghazal by Jagjit Singh. The list could be long. For change there was also reverse copying, the popular American Hip Hop Band, “Black eyed Peas” took portions of Ilayaraja’s “Unakkum enakkum anandam” by S.Janaki from ‘Sri Raghavendra’ and mixed it with one of their songs. There have been Tamil film songs, which were kept as they were with little or no changes when the original Tamil movies were remade in Hindi. The instances are “Ilaya Nila” of Ilayaraja from Payanangal Mudivathillai was largely the same in Kalakar in the music of Kalyanji Anandji. “Muthu kulikka vaareegala” of MSV from “Anubhavi Raja Anubhavi” was retained by R.D.Burman in “Dho Phool”. Adapting good musical notes from unknown cultures and blending it to our own music genres is after all is a creative service, I would personally opine. The outright lifting also perhaps served the same in times when Tamil films were not quite ‘connected’ with other languages and cultures, though within the country. Ultimately, all songs have to be within the parameters of the seven musical notes, “Sa Re Ga Ma Pa Da Ni”! Elephants have been used as attraction seekers in Tamil Cinema ever since a pachyderm called ‘Chandru’ played heroine, singing star Thavamani Devi’s (from Ceylon) accomplice in ‘Vana Mohini’ (1941). In this film, a rehash of a Hollywood ‘jungle’ movie , the story, screenplay and direction were by Hindi film actor and Director Bhagwan. The elephant virtually stole the hearts of all as he indulged in many tricks. ‘Sri Valli’ (1945), produced by AVM featured the elephant named Krishnan Kutty, sourced specially from South Perinkulam in Kerala, which is, by the by, also the village of this writer. In Gemini’s Avvaiyar (1953), a large herd of elephants were needed for a battle scene in the film and Vasan’s search ended in an elephant camp near Vayanad at Manandhavadi, which featured in the spectacular scene in which stampeding elephants attack a Fortress. In the MGR starred ‘Gulebakavali’ (1955), there was a much publicized scene of MGR fighting with a live Tiger. However, there is no mention of the tiger’s name in its credit titles. Now, I want to dwell in detail about exotic animal specie that featured in a Chennai produced Hindi Movie as early of the fifties. Mr. S. S. Vasan of Gemini Studios who had produced grand movies praised as Magnum Opus made a Hindi movie in the fifties, starring Dilip Kumar, Dev Anand & Bina Rai. After shooting quite a footage of the film, when Vasan reviewed the same he felt an immense need to introduce an animal character in the film, which he felt was otherwise dull. After all, Vasan has had the benefit of featuring a bunch of elephants in his immediately preceding grand Tamil film ‘Avvaiyar’, much to the movie’s box office advantage. Someone in his team suggested a monkey, which sparked an idea in Vasan’s industrious mind. In those times, Chimps were often featured in many movies & TV Shows with ample fan following in the USA. One of such Chimpanzees, called Zippy was a star of his own right there. He is believed to have earned about USD 55k per month through his busy engagements in TV Shows, Night Clubs & other special events. Living up to his reputation as India’s ‘Cecil B. DeMille’, the movie mogul, this time, turned his sights West and struck a deal to fly in Zippy, the Chimp, at a phenomenal price. Before the month was over, the chimp from Hollywood was on his way to India. Zippy, from USA, landed on a hot day in 1955, with his Trainer (Ralph Quinlan) & Owner (Lee Ecuyer), within a month, first At Santa Cruz Airport & then on to Madras Meenambakkam. The Hindu reported, “No star in recent times received such a tumultuous reception as was accorded to Zippy, the chimpanzee, at the Meenambakkam airport when he arrived with his trainer and owner”. I recollect, I was in fifth standard, when Zippy took Madras City by storm. Gemini Studio was issuing special viewing sessions of Zippy to the public. VIPs & school children were accorded special ‘audience’ with the great chimp. Zippy was an instant hit with the Press as well as the crowds who had been awaiting his arrival. As a news report in The Hindu noted the next day, “the patience of the crowd was amply rewarded when they had the fun of seeing the chimp walk and do things like a boy, and shake hands with all those who wanted to do so. With close fitting dress and boots, Zippy delighted the people by his mannerisms”. For the short period of a month that Zippy stayed in Chennai, he received royal treatment. Lee Ecuyer, in a New York Times interview, recounted people “bowing at our feet as though he really was royalty”. As Zippy was small in stature, scenes featuring the chimp were reportedly shot slightly lower than eye level, so cleverly that the audience never realized that the action on screen was physically impossible for such a small creature. The lovable diminutive young chimp Zippy, trained & adept at playing piano, roller‐skating and typewriting, besides several other feats, was featured in not just one but two song sequences — “Beta Bada Hoga’ and ‘Main Hoon Bandar Shaher Ka’ in the film ‘Insaniyat’. When the movie was at last released, Zippy was the Star, not the Bombay’s biggest stars, to the curious crowds. Their verdict was unanimous: the chimp had stolen the Show. It is learnt that as Zippy grew old, its owner found it difficult to manage it & donated it to The Bronx Zoo, New York. Some sections also conspired that since the owner Lee Ecuyer had multiple chimpanzees with him for featuring in TV shows, it was not clear whether the very ‘Zippy’ who landed in “Insaniyat’ was the same celebrity who had appeared on popular American shows ‘Howdy Doody’, “The Ed Sullivan Show’ or ‘Cheeta’ of “Tarzan’s Hidden Jungle”. There was another chimp called ‘Pedro’ who acted in Indian film produced by Homi Wadia of Bombay who specialized in making Tarzan kind of movies in Hindi. In fact he produced a series of such films, which were also dubbed & released in Tamil. In South Indian film industry there was Sandow Chinnappa Devar who regularly featured animals in his films. His delightful Hindi movie ‘Haathi Mere Saathi’, extolling the loyal instincts of elephants for their masters, starred Rajesh Khanna and Tanuja. There have been innumerable films in which animal species have appeared and it would be difficult to enlist all. Here is some of the cross section of movies with animal actors. Devar also produced Shatrughan Sinha‐Jaya Bhaduri paired ‘Gaai Aur Gori’ featuring a cow. The same film was remade in Tamil as ‘Aattukara Alamelu” replacing the cow with a goat. Thangamalai Rakasiyam (1957) had Sivaji Ganesan in a Tarzan­like character talking to elephants, which were picturised in Anamalai woods. 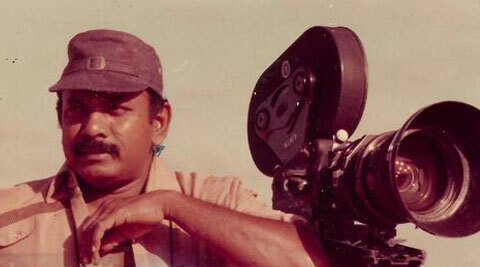 Chinnappa Devar, who used extensively animals in his films, made Yanaipagan (1960) & Nalla Neram (1972), the later with M.G. Ramachandran as hero, both these films featuring elephants. Yanai Valartha Vanambadi (1967) & its inevitable sequel, Yanai Valartha Vanambadiyin Magan (1972) too had pachyderms in stellar roles. Even in Kumki (2012) an elephant featured as a main character. Film ‘Saivam’ had a Rooster in it, whereas ‘Kumudam’ had a Cat in it in the song ‘Meow meow poonai kutty’. Server Sundaram had a parakeet in the beautiful song ‘Thathai nenjam’. However, it was nota talking parakeet, as was presented in the sequence. The parakeet’s voice in the song was lent by, mimicry artist who worked with MSV, named Saibaba (one of the sons of T.S.Baliah). Going forward too, the animal kingdom is sure to continuously attract the attention of film-makers throughout the world, for the simple reason that the animals are ever irresistible to people. The child in us would demand to see animals in films. However, the filming of animals in India is subject to certain regulations by the Animal Welfare Board of India. We only pray that the animals are not ill treated in the course of filming, as has been reported in the past.